If we were really to get hit with a walker-type disaster, sure. Load up on guns, bullets, and supplies (and ideally you have these stored in advance like I do). But you also want to be prepared with weapons that don’t require ammo. Inspired by Fear the Walking Dead, here’s my list of the essential weapons to have in your arsenal just in case we ever get hit with a crazy epidemic that turns dead humans into walkers. When we think about fearing the walking dead, the one vision that seems to populate our minds is a walker staggering towards us with outreaching arms. No matter how slow the walker approaches, they always tend to reach their target (eventually). For many, the thought of an epidemic apocalypse is better reserved for the TV show as opposed to a real-life occurrence. 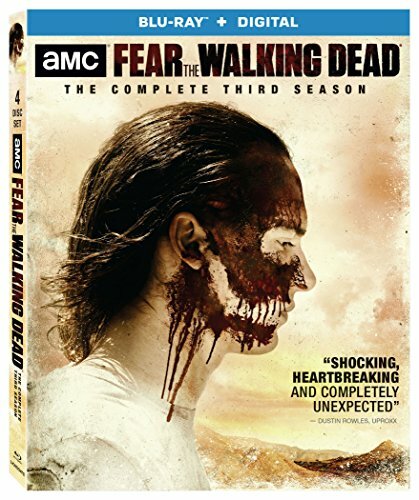 Even some of our own friends would ridicule us if we were to give them any inclination that the walking dead is something that we fear, not just on a TV series, but deep down in our gut. If you are like me, you pay attention to events that are happening all over the world. Chemical and biological attacks are becoming more prone in various areas throughout the world. We do not even need to look to some third world country for these atrocities… Our own military is more than capable of releasing viruses that will make us, fear the walking dead! Ninjato swords a shorter than Katanas (Michonne’s weapon of choice), but will get the job done. When it comes to dealing with the walking dead, the only surefire way to de-escalate the threat it to destroy their brains. The Ninjato is a sword that has been used by Shinobi for centuries. It is also the preferred weapon for modern day ninjutsu practitioners. The Ninjato resembles a Katana in size and length. 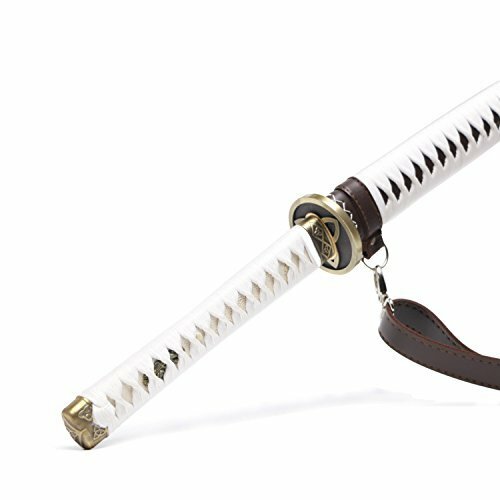 It is a short sword which makes it ideal to carry around in various environments. It is also extremely sharp which is what we want when it comes time to lop off the head of an undead attacker. It is the most cost-effective katana, and has more than 30 million fans in the United States. The warranty period for this product is 2 years, and customer service is provided 24 hours a day, 7 days a week. You do not need to have ninja-like skills to be able to utilize the Ninjato. If you have swung a baseball bat with either one or two hands and have relatively good aim, decapitating one of the walking dead can be achieved in short order. You may be in an area where previously, no zombie attacks have occurred. There is also the issue of gun and blade free zones. Having a trusty tactical pen built from aircraft grade aluminum may be your only option in an unforeseen battle with a zombie. Tactical pens are easily wielded by utilizing a reverse or hammer-fist grip. The tips on these tactical pens are made from tungsten. When a blow is rendered to the cranium of one of the walking dead, it will easily crush the skull and penetrate deeply into the skull scrambling the brains. If the skull is not a viable target at the time, shoving the tungsten tip of the tactical pen into one of the eye sockets, will certainly do the trick lobotomizing your zombie attacker. In the United States Marines, we were issued shovels or entrenching-tools (e-tools) as part of our kits. Not only were these shovels great for digging holes but they also were a viable tool when it came to self-defense. We trained with these shovels and became quite proficient with them. Many of us even sharpened the edges of our shovels in order to make them a more formidable weapon, this no doubt would help against zombie heads. A quick search on Amazon and you will come across a whole new line of e-tools that would make any zombie killer proud. The edges are designed for slashing and the tips of these shovels can easily penetrate a neck or skull. The e-tool can be staged in your vehicle or conveniently carried in your rucksack. The fact that to the common eye, it is just a shovel… makes it a weapon that easily flies under the radar. A shotgun with a bayonet mount is a no-brainer (pun intended) when it comes to an ideal weapon to battle the walking dead. With the right slugs, you can easily take the head off of a zombie while maintaining a safe distance. When you couple the shotgun with an M9 bayonet, you add a bit of redundancy to your killing ability. If you run out of ammunition and/ or just have issues with your sight picture and sight alignment, you can always slash or stab causing the correct deadly force needed for the situation at hand. 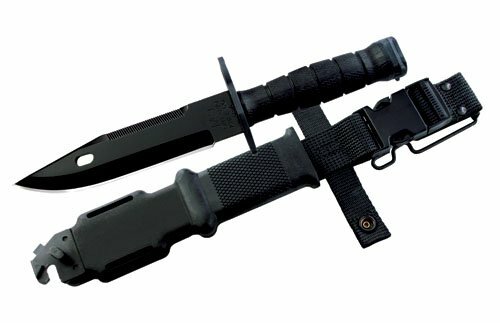 Keep in mind that having a good bayonet, such as an M9, is a formidable weapon on its own. Stage it on your belt and be at the ready for whenever a zombie comes a’ callin’. Thinking along the same lines as a tactical pen, the tactical flashlight is ideal for those situations where more formidable weapons are just not an option. These flashlights are also built from aircraft grade aluminum and feature a beveled end that we commonly refer to as a skull crusher. Deploying a simple hammer fist motion with the tactical flashlight can easily split a zombie skull like a coconut. The brains will be exposed to smash away and your mission will be accomplished. Playing baseball is somewhat of an American pastime. Many of us get exposed to the game of baseball at an early age. Being able to Swing Away and to try and Hit It Out Of The Park are ideal attributes that come in handy when it comes time to bludgeon an undead attacker. A good swing of the bat to the cranium will cause blunt force trauma. The zombie’s head will be crushed like a watermelon removing any threat as well as fear. These Pictures are Correct. 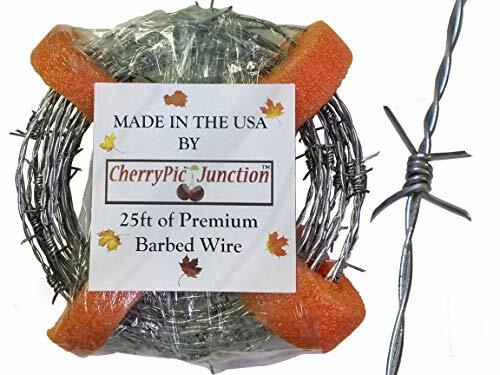 This is 4 Point REAL Barbed Wire. Metal and Sharp! Please handle carefully with gloves. High Tensile Light Duty 18 Gauge makes it easier to manage and bend into shapes. BUT it's still REAL Barbed Wire and it's not as malleable and easy to bend as copper wire. A baseball bat is also a formidable weapon because of its ability to simply be a baseball bat that is staged in your vehicle or pack. My only advice would be to also include a baseball and a glove… Your lawyer will thank you for it, zombies will still hate you. Since the walking dead are not winning any awards for their speed, anytime soon, a good way to diffuse their threat is to set them on fire. You won’t split their skulls but you will certainly cook the hell out of their brains. A Molotov cocktail is an improvised incendiary device that is used for igniting. This is a great option when the battle is clearly defined. You want to ignite the zombie, not your valuables or family members. You also want to make sure that they are at a distance when you deploy the Molotov cocktail. You do not want them in a close enough range where they can get ahold of you causing you both to go up in flames. Having a sharp ax or hatchet as part of your gear list can help to combat any would-be zombie that is trying to eat your brain. An ax can be used to deliver blunt force and it could also be wielded to chop. Either option, when deployed to the head, will get you the result that you want; a dead zombie that used to be able to walk. Just like other weapons in this article, the ax can be deployed with just one hand. This will allow you to use your empty hand for other tasks. It is also feasible to double up on axes (one in each hand) or add a different weapon of choice as part of your offense. One weapon is good but 2 are great! After you are done making minced meat out of the zombie attacker, you can always use the ax to cut wood as well as many other preparedness tasks. Multi-purpose applications are ideal in any well-designed preparedness plan. There are many other weapons that will keep the walking dead from having you join their ranks. The one main focal point that I want you to keep in mind is preparedness. Having the weapons at your disposal is only part of the equation. Perfect practice with these tools is what will give you the confidence to remove fear and accomplish the task at hand. Whatever you choose to bring to battle, make sure that you are well versed with that tool. They may be walking while they are dead but you are the one with the functioning brain. As the old adage states… Use It Or Lose It! In this case, truer words may never have been spoken. Fear the Walking Dead returns Sunday 9/8c on AMC. show me a machine gun!